Happy Independence Day! We shared ideas for a healthy and yummy 4th of July on Q13 FOX News. Everyone loved the Burger Bites, and there was none left before we left the studio! Burger without the bun couldn't get any cuter! This is a great appetizer. Serve with my special sauce and horseradish mayo, or any condiment that you would put on a burger! In a pound of grass-fed ground beef, add a 1/4 teaspoons each of garlic powder, onion powder, and salt. Add a pinch of pepper. Use your hands to incorporate the seasonings. Make a ball about the size of a ping-pong ball by rolling the beef in your hands. Then, carefully press the middle to make a disc. The center should be slightly indented so when they cook, they don’t turn into balls. 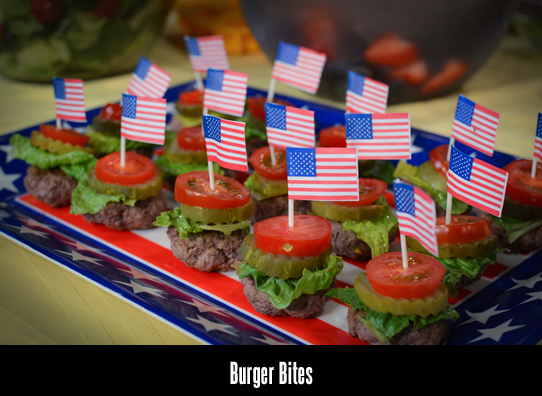 the burger patty, and use an American flag toothpick to secure them. Serve with special sauce and horseradish mayo on the side for dipping. Add blueberries, quartered strawberries, and ice. It’s so beautiful! Enjoy! 1. In a bowl, add bite-sized romaine lettuce. 2. Sprinkle in blueberries, quartered strawberries, and a little feta. 3. Slice english cucumbers into about 1/4 inch slices, and use a star-shaped cookie cutter to cut hearts out of the middle. 4. Place the stars and the circles (with star cutout) on top of the salad. 5. Use homemade or store-bought all natural poppyseed dressing and enjoy! Great idea – great appetizer. I used small slices of Roma tomatoes, which fit better than cherry. Option: Use any Decorated Toothpick & other matching Holiday platter for other events. Your Star-Spangled salad looks so beautiful that I would hesitate to break it up to eat it. Do I have to wait until 07/04/2014 to make this? No, this would be wonderful for any day of the year. Thank you so much, Mr. Iwamoto! I would love to meet you, and cook with you. You have awesome cooking shows! My Mom and I are starting a cooking show. I like being healthy also. I think being healthy is cool! I love your 4th of July snack I am going to make it soon. I love your cooking shows every Tuesday morning at 9:45. That’s great, Kyla! I’m so glad you think it’s cool too 😀 Yes, everyone should start a healthy cooking show! !